On this special holiday, I am grateful for family and for my siblings who have graciously bestowed upon me all of our parents' old papers, pictures, and mementos for safekeeping. I went through some of them yesterday and found this picture of a turkey that my Dad made sometime in the 1930's. He made it by cutting out pieces of construction paper for the bird's body and head and for the pumpkins. Then he added the artistic touches with crayons. It shows me that through the years, in my family at least, Thanksgiving means turkey for dinner. I'm going to my older sister's house for Thanksgiving dinner. We'll have turkey, of course, with all the fixin's and plenty of desserts. The best part is that I don't have to make any of those fine fixin's and desserts. Though, for the record, I did graciously offer to bring something. My sister said that wasn't necessary and I should just bring some Starbuck's iced green tea to drink if I wanted that. I'm also supposed to bring one old paperback book that was my Mom's. Just one. I have several boxes of old paperback books, mostly mysteries, and I could bring one for each person. But I'm supposed to bring just one. It is most likely for our post-Thanksgiving-dinner-sit-around-because-we-are-too-full craft project. I wonder what we are making this year for our post-Thanksgiving-dinner-sit-around-because-we-are-too-full craft project? 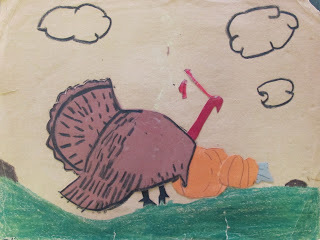 Maybe we should get some construction paper and make our own turkeys, just like my Dad made way back in the 1930's? What a wonderful tradition it would be to get out turkey pictures made by all every year. Hang them on the frig or wall someplace. What ever you do, have a Happy Thanksgiving. Just stopping by to wish you and your family a Happy Thanksgiving. Your Dad had some artistic talent. How lucky that you still have this 'work of art' for memories. Enjoy the day. Happy Thanksgiving. SOunds like the perfect day. How lucky that someone was thoughtful enough to keep all that memorabilia. I have so little but treasure every piece. Happy Thanksgiving. Love the artwork, it does show his talent at an early age. Glad it has survived. Glad you all will be together today. I hope your family has a wonderful day ... your mom and dad will be there with you in the memories you share. What am I thankful for? I'm thankful I found your garden blog! Thanks also for hosting GBBD each and every month.